Taking place between Dawn of the Planet of the Apes and War for the Planet of the Apes, Planet of the Apes: Last Frontier is an exciting interactive drama set in the fictional universe of Planet of the Apes. Drive the story to its ultimate conclusion by leading both apes and humans through an escalating series of ethically-challenging situations. A must for any Planet of the Apes fan who wants to drive their own story within thier favourite universe. 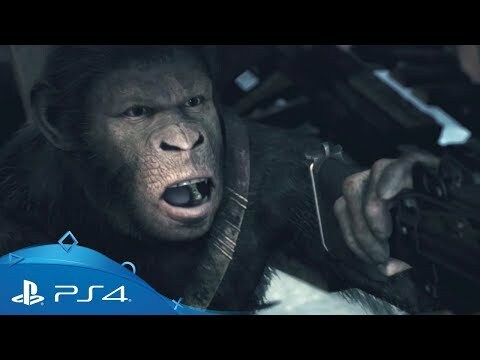 Planet of the Apes: Last Frontier is available to play on PlayLink, PlayStation 4 's newest way to play games with friends that users smart phones and touch devices to control the action. Use your mobile phone or tablet device to take control of the on-screen action, make crucial decisions or get creative. From quick-fire quizzes to immersive multiplayer experiences, PlayLink titles are all about social gaming that everyone can enjoy. Playing as both a tightnit crew of intrepid frontiersmen and a nomadic splinter group of apes, your choices will not only influence the group, but also be frustrated by them. Whether playing by yourself, or with up to three friends, majority rules will govern your actions, meaning things won't always play out as you want. Dialogue choices can be many and sometimes rapid, so thinking on your feet will crucial in order to influence the outcomes you want. With so much on the line, the ability to think on your feet could make all the difference. Looking for more great PlayLink titles? Enter the Pyramid of Power for a fantastically fun game show quiz from the PlayLink range, exclusive to PS4. Weave a tense and ever-changing story in this multiplayer crime thriller from the PlayLink range, exclusive to PS4. Get hilariously personal in this audacious social quiz from the PlayLink range, exclusive to PS4. Use all the devious tactics you can in this hilarious mini-game contest from the PlayLink range, exclusive to PS4.